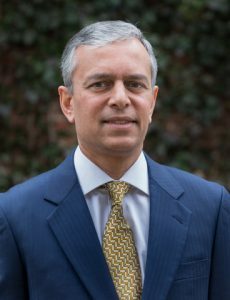 Venu Kotamraju graduated from UCLA with degrees in Mechanical Engineering and Economics in 1995 and later returned to his Alma Mater for his MBA in 1999. He is currently the president of Ram Foods, a major food production company in the Philippines with 1300 employees and distribution channels across the country. He is married to Ana Kotamraju, who also received her BA in Business Economics (’93) and MBA (’99) from UCLA. Ana is Senior Treasury Specialist at the Asian Development Bank. Venu was born in Hyderabad, India and moved to the San Francisco Bay Area as a child. As the son of a mechanical engineer, Venu naturally had an affinity for the physical sciences. He came to UCLA as a Physics major and later switched to Mechanical Engineering. While studying engineering, Venu discovered a new passion for economics. After taking a multitude of economics classes, he knew that he needed to pursue this discipline in greater depth. Venu chose these two majors because he had a solid quantitative and analytical background, which he was confident he could apply to business and economics. Attaining this rigorous combination of degrees was described by Venu as a long march, but one that taught him a lot and one which led him to a great place. Venu fondly remembers meeting some amazing people in Sproul Hall and the friendships that he forged within the UCLA community. One of his fondest undergraduate memories is witnessing the 1995 Men’s Basketball Championship game. He is eager to fly in from the Philippines the next time UCLA makes it to the NCAA finals. Venu was also the president of the Indian Student Union for 2 years and worked to have more classes representing the Indian community on campus. After I told him about the Bollywood music class I was taking at UCLA, Venu was glad to hear how his hard work and efforts had come to fruition. Upon receiving his undergraduate degrees, Venu went to work for Deloitte as a management consultant. After a few years at Deloitte, Venu decided to pursue his MBA. Even though he was advised to try a new university, Venu was a Bruin at heart and came back to UCLA for his MBA. And Anderson changed his life. We’re not talking about the degree here. We’re talking about how he would meet his future wife, Ana, at Anderson (UCLA’s School of Management). Somewhere between study groups, meetings and Anderson social retreats in the Bay Area, Venu and Ana fell in love. And the rest, as they say, is history. Venu describes the people he met at UCLA as his greatest treasure in life. He remarked how most of his groomsmen were Bruins. He accredits this to UCLA’s great culture. Venu reflects on how UCLA was a close-knit community, where everyone was extremely talented yet humble. He believes that Bruins are great people who never beat their chests. This combination of intrinsic greatness and humility present in every Bruin is what he believes makes UCLA such an amazing place. And it was this great community that helped him succeed in life. Venu also attributes his success to his ability to step out of his comfort zone and adapt, a skill which he acquired through the many different avenues he accessed at UCLA. Not surprisingly, when life knocked and asked him to move to the Philippines, he went without hesitation. Now spearheading his own business, Venu is a quintessential example of how a Bruin can thrive anywhere. Venu takes the time out of his busy schedule to stay connected. He believes that UCLA gave him a lot and he wants to give back. He is a member of the Board of Visitors at the Economics Department and has even started the Manilla chapter of the Alumni Association. Venu hopes that his children attend UCLA so that they give him an excuse to reconnect with his Alma Mater. Venu’s departing words were, “You never know where life will take you, but UCLA will always remain your home,” reminding us that once you’re a Bruin, you’ll always be a Bruin. Written by Harsh Gupta, with Josh Strickfaden, Undergraduate Economics Students.